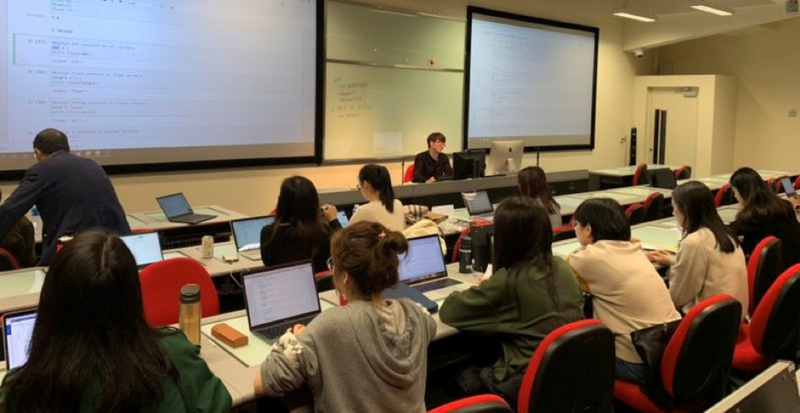 The Workshop, officially debuted as “MACNM Computational Workshop”, kicked off on Jan. 5, 2019 and continued on Jan. 6, 12, and 13 in Run Run Shaw Creative Media Center of City University of Hong Kong. Sponsored by the Centre for Communication Research (CCR) and Web Mining Lab of Department of Media and Communication, the Workshop aims primarily to serve graduates of MACNM to learn latest knowledge and skills of media analytics. Launched in 1998, MACNM was the first graduate program on new media in Hong Kong and Asia-Pacific. Over 1,000 students have graduated from the cutting-edge program over the last two decades. However, many of them had not been exposed to big data, machine learning, and other cloud computational techniques until very recently when MACNM offered a Media Data Analytics Stream. To fill the gap, Prof. Jonathan Zhu, director of CCR and founder of MACNM, organized the Workshop to help MACNM alumni to retool themselves. The 4-day Workshop covers topics ranging from Python Programming, Web Scraping, Text Mining, User Profiling, Online Experiment, Social Network Analysis, and Data Visualization, taught by PhD students of Web Mining Lab, including Lu Guan, Zhicong Chen, and Ji Lan, and their supervisor Jonathan Zhu, respectively. The Workshop is conducted in two modes, offline and online. The offline sessions attract several dozen MACNM alumni from Hong Kong and Shenzhen, who work for print media, TV stations, social media, and a variety of start-up tech firms. The online sessions are live broadcast to the world, with MACNM alumni viewers interacting with the teaching team through instant messenger. All teaching materials, including lecture videos, are accessible at Web Mining Lab website.